Whether or not a wet wedding day is in fact good luck, most brides would prefer sun and warmth over wind and rain. When picking our wedding dates we really can't know what the weather will bring us, but we can prepare for it. Yay for that. Keep in mind that the weather changes (obviously,) so what the forecast was a week before may be quite different to what it ends up being on the day. Keep checking it and look over a couple of different forecasts to be sure. Boots and brollies: Gumboots and brollies in your wedding colours make for fun photos and nice gifts to your bridal party. Go for something bright, subtle white may just blend in with the gray skies- doesn't make for interesting photos. If you don't succeed: Do it again another day. Not the wedding of course! But if you had your heart set on a certain shot or two and that darn weather ruined it, get yourself and your man dolled up again on another day. 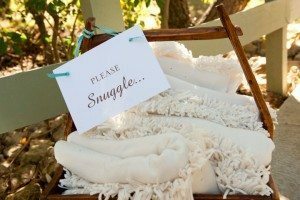 Brrr it cold out there: A basket of blankets or shawls and a bunch of umbrellas will be well received by your guests on a grey day. Hand it over: Interview your photographer and make sure they have a wet weather plan and on the day hand over that trust and let them guide you. Remember that some of the best shots are created on overcast dreary days. 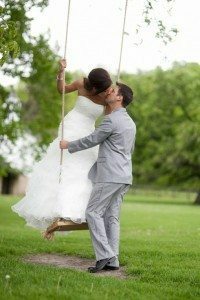 Be flexible: If there is a clear moment during your reception you may want to nip outside for some quick shots. Back-up plan: Every outdoor wedding needs a wet weather plan but also find an indoor space with good light and a nice backdrop for some photo time if it's wayyyy too wet to go outside. You can never be too prepared: Bring an old towel to wipe down wet benches (or swings) that you may need to use for your photos. Just remember you can't change it so you might as well embrace it!